Cherry Mobile has finally unveiled this JUNEtastic month its 7th and most affordable QUAD-CORE smartphone to date called the Cherry Mobile Thunder 2.0! 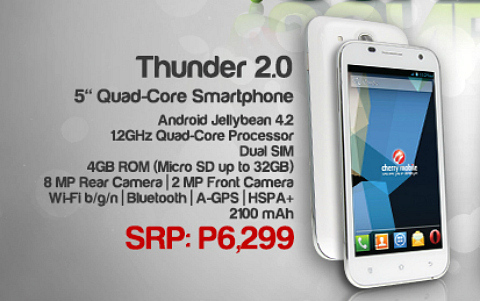 For only Php6,299 (SRP), the Thunder 2.0 is the successor to the four-month old Thunder and boasts a dual SIM, dual standby capability, 1.2GHz quad-core processor from MediaTek, 5-inch FWVGA capacitive display, 8MP camera + 2MP front and runs Android 4.2 Jelly Bean. The Cherry Mobile Thunder 2.0 is also one of the new phones that came out in Thailand! More details after the jump. 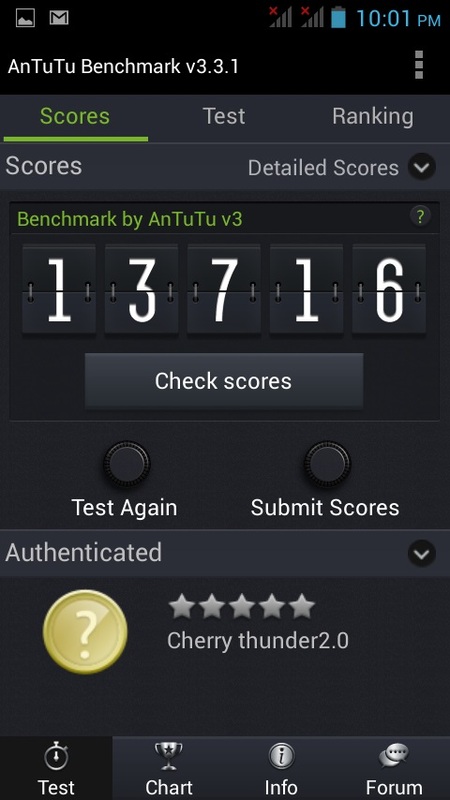 (07/02/13) Cherry Mobile Thunder 2.0 AnTuTu Benchmark Score. mga sir ang core poh ng gpu ang nagdadala ng grabehang graphics kya pag mas mataas ang gpu mas hndi lag khit 512 p ang mb katulad ng powervrsgx544 malaki po ang ang laman in terms pang gaming kc dito dinadala ng graphics like 3d and hd ang powerful scalable ang powerVR SGX544 khit ang ram mo 512 bkt ang iphone4s ang ram niya ay 512 mb lng kya hndi loggers kc mas malaki ang at mdaming core ang gpu ng iphone4s ito core nyon powerVR sGX543MP2. mga pre nabasa ko mga gpu ng povervr series 5.Pero kung mhilig kayo mag multi tasking tapos 512 mb ang ram mag lalag un kc baba eh.hndi katulad ng iba 1 gm to 2 gbytes. 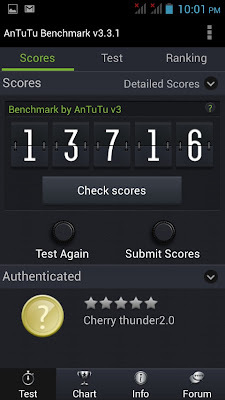 dahil wvga ang resolution nito compared sa ohd 2.0 na hd display.. same sila ng cpu..
Bakit mas mataas benchmark nito compared sa Omega HD2.0? Gotta save my money for this!! !